DILG-8 Regional Dir. Pedro A. Noval Jr. (in red) and Mayor Reynato Latorre (in yellow) lead the groundbreaking of the water project for Villareal, Samar. At the foreground is Engr. Ofelia Pido of DILG. TACLOBAN CITY – Residents of the town of Villareal, Samar may have forgotten that tap water once flowed into their homes. After all, it has been decades since residents enjoyed water from their faucets instead of needing to be fetched in pails and other plastic containers from deep wells. However, all these could change in a few months as the municipality last August 15, 2012 broke ground for a 25-Million peso water project that stands to benefit about 14,000 people or 60% of its population. The project is a soft loan from the Municipal Development Fund Office (MDFO) under the Department of Finance (DOF) and the Department of the Interior and Local Government (DILG). DILG-8 Regional Director Pedro A. Noval Jr., the guest of honor, lauded municipal officials led by Mayor Reynato R. Latorre for persistently pursuing the project after years of exploring alternatives for a viable water source. “This project will be one of your legacies to the generations to come. With a dependable supply of safe drinking water, there will be less water-borne diseases and you will have more time spent for other aspects of life instead of needing to fetch water from communal faucets,” said Dir. Noval. On the other hand, Mayor Latorre revealed that the municipality shall form a cooperative to run the facility. He expressed confidence there would be no more repeat of previous incidents of kaingin (slash and burn farming) that decreased the flow at the water source (Milagrosa Falls in Brgy. San Andres), as well as of pipes being vandalized for irrigation purposes, which led to the decay of the town’s original water system. In his speech, Mayor Latorre narrated how the town was finally able to secure an extension of the loan offering. The municipality’s Memorandum of Agreement with DOF was about to lapse when he approached MDFO on June 28, 2012. The DOF official agreed, on the condition that the town complies with the DILG’s Full Disclosure Policy and the standards of the Seal of Good Housekeeping, consistent with this administration’s campaign to institutionalize transparency and accountability. Fortunately, the LGU was able to show such certification from the DILG-8 Regional Office, and so his request was granted. The LGU has commissioned Houston Construction for the project, which includes upgrading of the existing water intake box at the site, installation of a water treatment facility, construction of a ground reservoir, and laying down of transmission and distribution pipes. The project is to be completed by February 2013. Fourteen (14) barangays will be set up with Level 3 (household level) water systems, with Level 2 (communal faucets) also being installed in five (5) of these barangays to accommodate those without water connections. Six barangays in the town proper are covered by this water project. These are: Central, Mercado, Miramar, Soledad, Tayud and Villarosa. Residents in eight (8) rural barangays will also be able to avail of the new water system: Cambaguio, Canmucat, Mahayag, Pacoyoy, Pangpang, San Andres, San Roque and Ulayan. The interest rate under the Millennium Development Goal (MDG) Fund has been reduced to 6% from the original 8% to enable easier payback. Nationwide, about 600 LGUs are classified as “waterless”, or those where most of its population do not have a reliable supply of safe drinking water. To help address this problem, DILG provides advocacy and technical assistance in document preparation and fund sourcing through the MDG Fund and Sagana at Ligtas na Tubig sa Lahat (SALINTUBIG) programs. The Communist Party of the Philippines (CPP) today denounced the Aquino regime for reissuing and raising the bounty against leaders of the National Democratic Front of the Philippines (NDFP) in violation of the Joint Agreement on Safety and Immunity Guarantees (JASIG). This latest move reveals the Aquino regime's lack of serious intent with regard peace negotiations with the NDFP, said the CPP. Yesterday, military and security officials of the Aquino regime announced that the bounty for a number of NDFP officials, including Comrades Benito Tiamzon and Jorge Madlos (Ka Oris), has been raised to as much as P5.5 million. Both Tiamzon and Madlos are key and prominent officials of the NDFP, the latter serving as spokesperson of the NDFP in Mindanao. The JASIG, which was signed by the principals of the Philippine government (GPH) and NDFP in 1998, binds both the GPH and the NDFP to guarantee the security of negotiators, consultants and personnel of the parties engaged in the peace talks. It prohibits subjecting peace personnel of both sides to surveillance, arrest, detention, filing of criminal charges and any persecutorial or punitive acts that would impair their effective participation in the peace talks. "Since assuming power," added the CPP, "the Aquino regime has been violating the JASIG with impunity." There are a number of NDFP consultants currently incarcerated in various police and military detention centers. These include, among others, Alan Jazmines, Tirso Alcantara, Renante Gamara, Ramon Patriarca, Eduardo Serrano, Eduardo Sarmiento, Pedro Codaste and Randy Malayao. "The most recent violation of the JASIG was the abduction last August 5 of NDFP-Southern Tagalog consultant Jesus Abetria and a member of his staff, Restituto Galicia, in Kalayaan, Laguna by operatives of the Philippine Army and Philippine National Police." "Furthermore, the GPH has yet to face responsibility for the abduction and enforced disappearance in 2006 of NDFP officials and consultants Leo Velasco, Pedro Calubid, Rogelio Calubad and their staff," said the CPP. Victims to Malacañang: Bounty increase useless, arrest the fugitives! QUEZON CITY – Families of victims of human rights violations said Friday that the increase in the bounty of high-profile fugitives is useless if the Aquino government is hell-bent in arresting and punishing the perpetrators. Concepcion Empeño, mother of Karen and co-complainant of Cadapan in the kidnapping with serious illegal detention case against Palparan, echoed the sentiment. “Kung sinasabi ng Malacañang na hindi sila nasisiyahan na hindi pa nahuhuli ang mga pugante, aba lalo na kami. Pero tingin namin, balewalang taasan ang reward kung hindi rin nila hahanapin. Ang dapat, pagsikapan at totohanin nila ang paghanap (If Malacañang said they are not happy that the fugitives have not been arrested, we are all the more dismayed. However, we think that the raise in the bounty is useless if they will not look for them. What they should do is to exert all efforts to genuinely look for them),” Empeño said. “Tingin namin, laru-laro lang ang ginagawa nila. Parang ayaw talaga nilang hulihin (It looks like they are just playing around. It seems they really do not want to arrest him),” Empeño said. CAMP RUPERTO KANGLEON, Palo, Leyte – The Police Regional Office 8 (PRO8) celebrated the 111th Police Service Anniversary today, August 16 at the PRO-8 Grandstand, Camp Kangleon, Palo, Leyte with the recognition of outstanding PNP units and personnel for notable achievements and outstanding performance and other partners for active participation in law enforcement campaign serving as highlight of the celebration. “The celebration was not only an occasion to remember our storied past and rich history but also an opportunity to give due recognition and honor our men and women in the Police Regional Office 8 whose efforts have been instrumental in helping the organization fulfill our mission of peacekeeping.”, PCSUPT Elmer Ragadio Soria, CEO VI, newly installed PRO-8 Regional Director, said. He added that such recognition would also inspire the men and women of PRO-8 to further improve their craft and serve the people of Eastern Visayas well. With the theme “Pulis N’yo Po sa Tuwid na Daan, Serbisyong May Pagkukusa, Maaasahan,” the celebration was graced with the presence of Governor Jericho “Icot” L. Petilla, Governor of Leyte who was the Distinguished Guest of Honor and Speaker. Others in attendance were Dir. 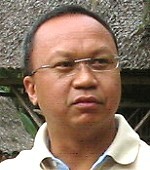 Pedro A. Noval, RD, DILG-8; Dir. Nicomedez E. Jose, RD, NAPOLCOM; FSSUPT Pablito D. Cordeta, RD BFP and JSSUPT Hernan G. Grande, RD, BJMP. Leyte Police Provincial Office bested five other PPO’s in the regionwide search for Best PPO for its outstanding administrative and operational accomplishments consistent with the 10-point agenda of the PNP. Other unit awardees are the Tacloban City Police Office (Best City Police Office); Eastern Samar Provincial Public Safety Company (Best Provincial Public Safety Company); Tacloban City Public Safety Company; (Best City Public Safety Company); Borongan City Police Station (Best Component City Police Station) and Javier Municipal Police Station (Best Municipal Police Station). The chiefs of offices received the Plaque of Merit and Unit Streamer in behalf of their respective units. Meanwhile, citations were also awarded to the distinguished police offices and personnel from all over the region. Plaques of Recognition were also given to the following individual awardees: PSSUPT Eusebio Adamero Mejos as the Best Senior PCO for Administration; PSUPT Avelino Bogtong Doncillo, Jr. as the Best Senior PCO for Operations; PCINSP Felipe Rellita Tan as the Best Senior PNCO; SPO2 Marissa Astorga Monge as the Best Senior PNCO; PO3 Catherine Butad Apuya as the Best Junior PNCO and NUP Russel Roa Capahi, Provincial Supply Accountable Officer from Southern Leyte PPO was adjudged as the Best Non-Uniformed Personnel. PRO-8 also recognized the local government unit of Tacloban City, adjudged as the Best LGU Partner 2011, wherein Tacloban City Mayor Alfred Romualdez himself received the award together with his wife City Councilor Cristina Gonzales Romualdez. On the otherhand, Forester Marciano Talavera also received the award for Eastern Samar PENRO as Best LGA Partner 2011. August 8 is celebrated as anniversary of the police service in commemoration of the founding of the Insular Constabulary in August 8, 1901 under Commission Act No. 175 and the merging of Philippine Constabulary/Integrated National Police (PC/INP) in August 8, 1975 by virtue of Presidential Decree No. 765. Both are forerunner organizations of the Philippine National Police. In PRO8 however, the celebration was rescheduled to August 16 to give way for the turn-over ceremony of the new Regional Director last week. QUEZON CITY – In a decision issued by the Bureau of Labor Relations (BLR) of the Department of Labor and Employment (DOLE), the Aquino government upheld the Presidency of Atty. Democrito T. Mendoza over the Trade Union Congress of the Philippines (TUCP). The Bureau of Labor Relations ruling stemmed over the disputed leadership of the largest labor center in the Philippines between its erstwhile longtime leader, Atty. Mendoza and his former political lieutenant, former Senator Ernesto F. Herrera. The BLR ruled that the parties to the dispute must revert to the status quo ante whereby the President of the TUCP is Atty. Democrito T. Mendoza and the Secretary General is Ernesto F. Herrera. The Department of Labor ruling also called for the holding of a special TUCP convention upon finality of the order for the Convention to elect its officers. “This affirmation by the government of the Presidency of TUCP of Democrito T. Mendoza is a welcome development and lays to rest the spurious, self-serving claim of “Boy Herrera””, said TUCP Vice President and Philippine Airlines Employees Association (PALEA) President Gerry Rivera. “Eighty percent (80%) of TUCP affiliates, including PALEA kept faith that the DOLE-BLR decision would uphold our stand that Atty. Mendoza remains our TUCP President. We are looking forward to the holding of the special convention where we intend to invite observers from the International Labor Organization to show that the great majority of TUCP remains with Mendoza”, said Gerry Rivera. PALEA-TUCP pointed out that the role of TUCP in organizing a new labor coalition called NAGKAISA, along with the Alliance of Progressive Labor (APL) and the Partido ng Manggagawa was precisely predicated on the leadership of Mendoza over TUCP. “Mr. Ernesto Herrera’s past political actions and behavior are interpreted as being supportive of the contractualization program which has led to millions of workers suffering from no security of tenure, working on the basis of 5-months employment contracts,” explained Rivera. “If Herrera were leading TUCP, NAGKAISA would never have happened. Herrera has huge credibility problems with the bulk of the labor movement holding him responsible for contractualization, on the other hand Mendoza has provided sound guidance to establishing broader labor unity to strengthen security of tenure rights. Mendoza proved to be the true trade unionist. It is really hard to put a good man down,” said Rivera. Ex-Senator Herrera claimed that Atty. Democrito T. Mendoza resigned from the TUCP Presidency on November 1, 2011 and that by virtue of his position as Secretary General of TUCP, he succeeded to the Presidency. “Atty. Mendoza submitted a letter of resignation to register his displeasure at the financial mismanagement of Mr. Herrera. However the TUCP General Council and the TUCP Executive Board never acted on the letter and actually prevailed on Atty. Mendoza to resume the Presidency. We are pleased that the DOLE has declared Atty. Democrito T. Mendoza as the legal President of TUCP,” said Victorino Balais, President of the Philippine Trade and General Workers Organization (PTGWO) and TUCP Secretary General under Mendoza. “The break in the higher ranks of TUCP, has brought about a major realignment of labor groups with 40 labor federations and organizations coming together with the TUCP of Democrito T. Mendoza in forming a new labor coalition called the NAGKAISA (United). A more pro-active and relevant TUCP with the combination of the experience of Mendoza and a more politically engaged leadership provided the new critical mass in organizing NAGKAISA to advance the cause of workers particularly in our fight for security of tenure,” added Balais. “We are supportive of the special convention as it not only will show the the trust that the trade union movement has for Mendoza, but also the need to create a new labor alliance across the entire political spectrum,” said Mendoza. MANILA – Vice President Jejomar C. Binay is optimistic that the P2 million bounty on Globe Asiatique (GA) owner Delfin Lee will lead to his arrest and the subsequent justice for all his victims. Lee is accused of using "ghost borrowers" and fake documents to obtain over P6.5 billion in loans from the Home Development Mutual Fund (Pag-IBIG) for its Xevera housing project. 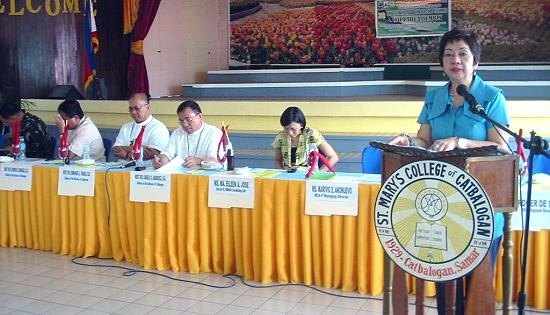 CATBALOGAN CITY – Marivic Añonuevo, Chairman and Executive Officer of the Millennium Challenge Account-Philippines said during a forum in Catbalogan City, Monday that KALAHI-CIDSS is people empowerment. Speaking before members of the Samar Island Partnership for Peace and Development (SIPPAD) 20th assembly, Añonuevo hailed the way the different communities handle the different sub-projects. There are 14 municipality-beneficiaries in Samar which are in the advance stage of sub-project implementation. 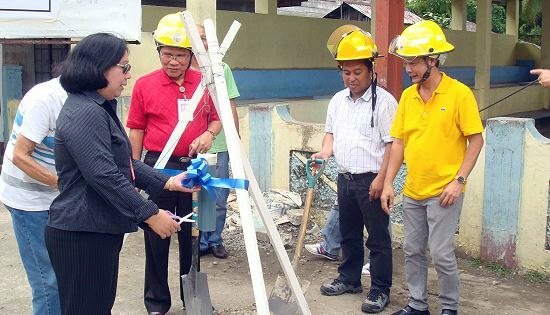 The lady mentioned that on May 16, the MCC Deputy Vice-President Tom Hurley led the inauguration of a concrete pathwalk project in Barangay Bato in Paranas, Samar. She also mentioned that on June 19 United States Ambassador to the Philippines Harry K. Thomas Jr. went to Sta. Margarita to visit the ongoing construction of a two-classroom school building which has a total project cost of P1.3 million. She said that KALAHI-CIDSS is a community-driven development project that MCA-P implements with the Department of Social Welfare and Development (DSWD). “As of July 2012, 1,057 sub-projects have been prioritized by Batch 1 municipalities, or those that are under the Makamasang Tugon stage,” she said. Most of the sub-projects are for basic social services, such as school buildings, health stations and day care centers; and basic access infrastructure projects such as farm-to-market roads and concrete pathwalks. “For our Batch 2 municipalities, around 95 percent of the 70 randomly-selected municipalities have completed the social preparation stage with the conduct of their second barangay assemblies,” the resource speaker from MCA-P said. “As soon as the second phase of training on the Community Empowerment Activity Cycle (CEAC) is conducted for members of the Area Coordinating Teams and the Municipal Coordinating Teams, these municipalities will move into the third phase, which is project identification, selection and planning,” Añonuevo told the attendees led by the three Bishops of Samar. BORONGAN CITY – Congressman Ben Evardone (LP, Lone District, Eastern Samar) is urging the national government to revive the Balik Probinsya Program to encourage informal settlers in Metro Manila to move back to their own provinces. In a statement, Evardone said that informal settlers who will be directly affected by the clearing operations of waterways and easements should be given priority should this program be restored. Earlier, Secretary Jessie Robredo of Department of Interior and Local Government (DILG) made a statement that the national government is planning to relocate some 100,000 informal settlers living near danger zones in Metro Manila. Public Works Secretary Rogelio Singson also said early this week that the government would “blast” the houses of informal settlers and other blockages that worsen flooding. Singson’s announcement drew flak from urban poor groups. Evardone, however said that the government’s effort to free the waterways and easement areas is a bold and laudable move. I fully support the initiative of President Aquino to clear waterways and easement areas of informal settlers for their safety, Evardone said. The congressman for his part believes that while the sight of relocating informal settlers is unacceptable to some sectors but he said the government needs to do something to ease up the worsening floods in urban areas like Metro Manila. With his (PNoy) political will, I don’t see any reason why this will not succeed, Evardone stressed. Under a revived Balik Probinsya Program, the neophyte congressman is proposing that those who will avail should be given free transportation allowance, start-up capital to enable them to start livelihood projects and dislocation allowance. They should also be given priority in housing programs of National Housing Authority (NHA) and the Local Government Units (LGUs), Evardone added. He said that the DSWD should also prioritize them in their core shelter program. Evardone also said that this arrangement should also provide beneficiaries free agricultural and fishing equipment and tools, scholarship of their children and automatic membership in the Conditional Cash Transfer Program of DSWD. He also is urging the Technical Education and Skills Development Authority (TESDA), Department of Trade and Industry (DTI) and Department of Science and Technology (DOST) to also provide livelihood training programs to affected individuals or families. The DILG should mandate LGUs to provide counterpart programs to those who will be relocated to their areas, he continued. Eastern Samar’s representative said that with this program, it will help ease the resistance of those who will be relocated. The Balik Probinsya Program was first introduced when Metro Manila was hit by typhoon ‘Ondoy’ which displaced around 200,000 families due to heavy flooding. MANILA – Vice President Jejomar C. Binay said Wednesday that Overseas Filipino Workers (OFWs) with families living in areas under a state of calamity may apply for the Home Development Mutual Fund’s (HDMF or Pag-IBIG Fund) calamity loan. TACLOBAN CITY – The Highly Urbanized City of Tacloban is one of the HUCs with the highest Overall Performance Index (OPI) for the last three years in the Local Governance Performance Management System (LGPMS) administered by the Department of the Interior and Local Government (DILG). This was revealed by Director Pedro A. Noval Jr. of DILG Region 8, who said that based on data collated by DILG central office from the annual LGPMS, Tacloban City garnered an OPI of 4.77 out of a total possible of 5.00, making it among the city governments that gained the highest scores for the period 2009 to 2011. Meanwhile, 13 provinces, cities and municipalities have emerged as consistent top performers in the local government state of performance report. DILG Secretary Jesse M. Robredo identified the consistent top performing LGUs as the provinces of La Union, Cavite, Albay and Ilocos Norte; the cities of Valenzuela, Makati, Angeles, Taguig, Davao, Laoag, Vigan, and Cabanatuan; and the municipality of Ilagan in Isabela province. “I extol these local governments for their unwavering commitment in scaling up and maintaining the highest standards of public service delivery in their respective localities. Their shining examples serve as an inspiration to others to strive hard in the performance of their mandates”, he said. The 13 LGUs regularly made it to the top 10 provincial, city and municipal governments that gained the highest scores in the LGPMS. LGPMS is primarily a self-assessment management and development tool that not only enables local governments to determine their capabilities and limitations in the delivery of public services, but also provides information on the state of local governance performance and their state of local development. Dir. Noval said that LGPMS rates LGUs with a performance area index ranging from one to five, with one as the lowest and five as the highest. The areas being tested are: administrative governance, social governance, economic governance, environmental governance and fundamentals of good governance, which include transparency, participation and financial accountability. Under existing guidelines, a team composed of representatives from the national and local governments conducts the evaluation, while results are being validated by civil society organizations to maintain impartiality. LGPMS topnotchers do not only earn the distinction of being among the best performing LGUs but they will also have a greater chance to be nominated to the Gawad Pamana ng Lahi, which is being conferred to LGUs that advances the tenets of good governance based on certain criteria, including the LGPMS. Provinces – Bohol (4.91); La Union (4.89); Cavite (4.88); Pangasinan (4.87); South Cotabato (4.864); Mountain Province (4.855); Albay (4.839); Bulacan (4.836); Rizal (4.832); and Ilocos Norte (4.828). Highly urbanized cities – San Juan City (4.9); Puerto Princesa City (4.88); Iloilo City (4.87); Valenzuela City (4.85); Makati City (4.819); Angeles City (4.816); Tacloban City (4.77); Quezon City (4.75); Taguig City (4.71); and Davao City (4.7). Component Cities – Laoag City (4.99); Naga City (4.93); Vigan City (4.921); Ligao City (4.917); Tagaytay City (4.87); Cabanatuan City (4.86); Dipolog City (4.83); Calamba City (4.82); San Fernando City, La Union (4.81); and La Carlota City (4.79). Municipalities – Ilagan, Isabela (4.92); Carmona, Cavite (4.9); Santol, La Union (4.89); Alimodian, Iloilo (4.883); San Mateo, Isabela (4.879); San Luis, Aurora (4.86); Surallah, South Cotabato (4.843); Maslog, Eastern Samar and New Lucena, Iloilo (4.839); Bacoor, Cavite (4.822); and San Gabriel, La Union (4.820). Anyone may access LGPMS scores of LGUs through the DILG website http://www.blgs.gov.ph/lgpmsv2/cmshome/index.php.